Race 3 RCR - De website van onroad-electro! The third round of the FBA Belgian Electric On-road Nationals was held at the fast track of Roeselare in the western part of the country. For the organising club RCR it was a special event as it would be the last national electric race at the current track as the circuit will be relocated near the motorway in time for the 2018 season. The long 4-day weekend meant that most drivers had plenty of time to find the right setup on the bumpy track with its long 90m straight line. Many drivers tested a PSS system in order to find the perfect handling but the traditional four classes of Rookie, Touring 13.5, Formula and Touring Modified were run on a single day. It was very exciting to watch the Modified Touring class race on this track. The long straight saw speed in excess of 100km/h, but the bumps made it very difficult to drive five minutes without mistakes. Some of the bumps that played a role in the slower classes proved to be a real handful in Modified. 16 drivers entered this class, which is a very good turnout compared to the other classes. In Q1, Belgium frontrunner Olivier Bultynck immediately made his intension clear to get the pole position for the A-mains as he finished four seconds clear of Thomas Stockman (Xray). Nicolas Delisé (Awesomatix) closely followed and Athan De Witte (VBC) and Rico Claeys (Xray) finished in 4th and 5th respectively. In Q2, Ollie’s transponder called it a day, after recording five sub 16 seconds laps. The fastest time of the round went to the Awesomatix of Mitchell van Es, followed by the Xrays of Steve Lambrechts and Rico Claeys, while young Liam Van de Wouwer (Yokomo) taking a nice P5. Q3 would see less technical problem. Ollie improved his time even further and took P1 in front of Mitchell. Giovanni Verbrugghe (Xray), the reigning 1/5th scale European Champion, finally had a glitch free run and took P3, just in front of Thomas Stockman and Rico Claeys, giving an overall top 5 qualifying order of Olivier Bultynck (Awesomatix), Mitchell Van Es (Awesomatix), Thomas Stockman (Xray), Nicolas Delisé (Awesomatix) and Giovanni Verbrugghe (Xray). In the opening A-main Olivier Bultynck took the holeshot and a convincing victory. Mitchell Van Es finished only two seconds back, which proves that the young driver is continuously making great progress. Thomas Stockman remained on his P3 starting position whereas Rico managed to get a P4, coming from P7. Giovanni Verbrugghe rounded off the top 5. In A2 Ollie looked set for another easy victory, but he fell victim of the treacherous track as well. His car did a 360 while going over a bump. Fortunately for Olivier, he was able to conserve his lead. Mitchell was less fortunate and he lost his P2 to Thomas on lap 12. This let Nicolas Delisé through as well, and he took a well deserved P3. Nicolas was very unlucky with his package breaking a spool and a diff in different heats. Behind Mitchell, young Athan De Witte (VBC) took P5 by driving an intelligent and steady race. As Ollie decided to sit out A3, Mitchell was keen to get the win in this final to cement his P2 overall position. He did so masterfully. He preceded Thomas Stockman, who tried all he could to catch the young dutch driver, but had to settle for 3rd. On the final lap, Liam Van de Wouwer snatched a great P3 from the unlucky Nicolas Delisé. This was the best position the 13-year old driver finished in since racing in the Modified class. 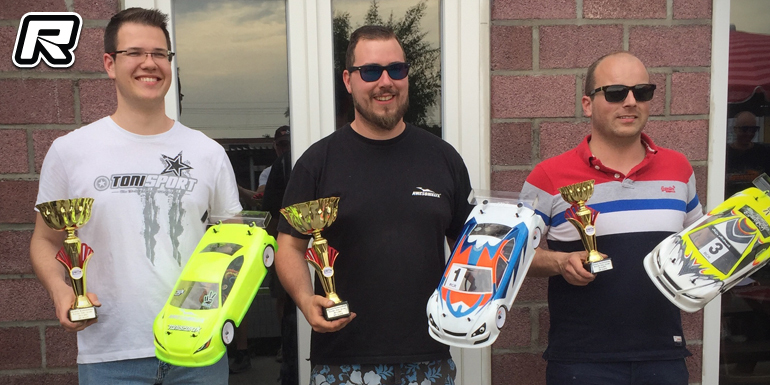 4th went to the unfortunate Nicolas Delisé while Steve Lambrechts (Xray) finished in 5th, giving the overall result of Olivier Bultynck (Awesomatix) 1st, Mitchell Van Es (Awesomatix) 2nd, Thomas Stockman (Xray) 3rd, Nicolas Delisé (Awesomatix) 4th and Rico Claeys (Xray) 5th. With 23 entered drivers Touring Stock, run according to ETS rulses, was the biggest class of the day. In Q1 most of the drivers started on new Volante tyres. Vincent Van Gansen (Xray) started from P1 and immediately set a scorching pace. Vincent drove superbly and his car looked to be glued on the track. After the qualifier the times told the whole story. Vincent’s average time was within 0.17 seconds of his single fastest lap time, which is quite amazing. P2 went to the VBC of Peter Degrande who was only 0.6 seconds behind Vincent. P3 went to the Team Magic of Pasquinel Neys and he was followed by the Tamiya of Florian Joos and the Destiny of Niels Meurs. In Q2 Stefan Rommens (Team Magic), recorded the single fastest laptime but had some mishaps. Vincent was running strongly but Stefan put him under real pressure with a potential FTD. Stefan’s car was very twitchy on the bumps, so he had to nurse his car round and lost a potential pole. In his quest to find the missing speed on the long straight, Florian tried an aggressive setup. It gave him a bit more top speed, but the car was too tricky to handle. He took P3 in front of Pasquinel and Niels. Q3 would be a real thriller as Stefan was running on the edge to get the FTD. For 11 laps it was looking great, but he then hit a bump at the esses which put his car almost in the barriers. Stefan managed to save it, but had to settle for overall P2. Pasquinel took P3 in front of Giovanni Moguez (Xray) and Niels Meurs. Florian pulled out of the qualifier as a motor change made his speed problem only worse. 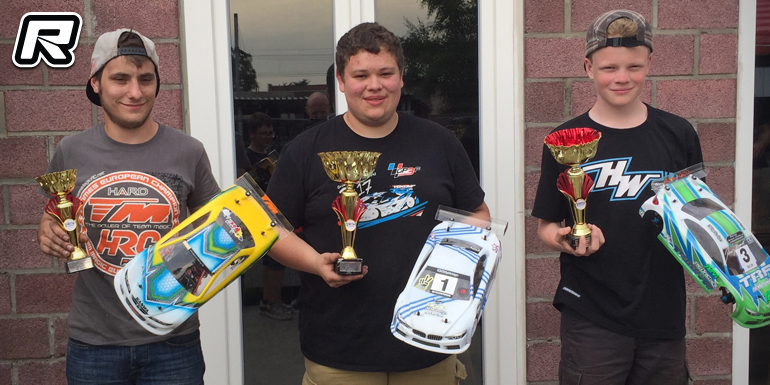 The top 5 results were Vincent Van Gansen (Xray), Stefan Rommens (Team Magic), Florian Joos (Tamiya), Peter Degrande (VBC) and Pasquinel Neys (Team Magic). In A1 Vincent took the holeshot and was closely followed by Stefan Rommens and Florian Joos. Olivier Bultynck borrowed Florian a motor and this enabled him to keep closer on the main straight. Stefan put tremendous pressure on Vincent who successfully fended off several attempts by Stefan. On lap 9 however, Vincent ran over the same bump that unsettled Stefan in Q3. Vincent had to get off the throttle and run wide, and Stefan immediately took the opportunity to take P1. Stefan seemed to have the win in the bag, but he ran a bit wide on the penultimate lap, which enabled Vincent and Florian to get back into his slipstream and so the order was Stefan, Vincent, Florian, Giovanni Moguez and Pasquinel Neys. For A2 Stefan was eager to get things over and win A2 as well. He tried several passes on Vincent who kept the door shut. Stefan tried a daring pass at the end of the straight, but this sent his car into a spin and to the back of the field. Florian crept a bit closer to Vincent, but had to settle for 2nd, 0.9 of a second back. The battle for P3 was won by Peter Degrande who preceded the Xray of Peter Roeygens and the VBC of a cleverly driving Xavier Debroye who started from P10. At the start of the final A-main, Florian got a great start and jumped Stefan for P2. The cars raced door to door through the fast left-hander, but as Florian had the inside line, he was able to take P2. What ensured was a very hard battle for P2. Stefan had a higher top speed and Florian blocked him by moving to the inside line on the straight. Stefan tried everything, but he couldn’t get passed despite some great attempts. In the meantime, Vincent was quite happy as this battle gave him a well earned overall win. 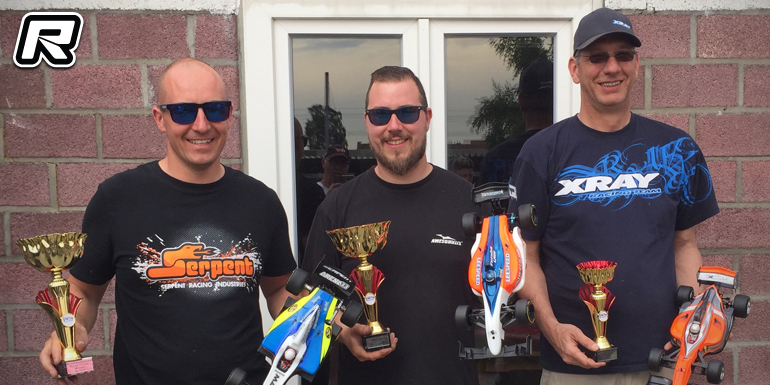 Final positions were Vincent Van Gansen (Xray), Florian Joos (Tamiya), Stefan Rommens (Team Magic), Peter Degrande (VBC) and Pasquinel Neys (Team Magic). Formula, also run according to ETS rules, was the smallest class of the weekend with only ten entries. In Q1 Olivier Bultynck (Shepherd) set a very fast time in the first run. He was followed by Steve Deblaere (Serpent), Florian Joos (Shepherd), Nicolas Delisé (Roche) and Frans Engelen (Xray). As his time in Q1 was almost five seconds clear of Steve in P2, Ollie decided to sit out Q2 and Q3 in order to save his tyres. This made the other drivers a bit nervous, but most still decided to run. Steve maintained P2 but lowered his time, while Frans really went for it and grabbed P3. Both Florian and Nicolas made a mistake early on and abandoned their run. Frans and Steve joined Ollie and decided not to run in Q3. Florian was on a potential P2 run, but a mistake meant he had to settle for P4, 0.1 of a second behind Frans. Nicolas took the 5th position on the grid. In the finals everyone was eager to see if Olivier Bultynck’s gamble would pay off. At the tone, he shot off and never looked back. Steve in the meantime got airborne over a large bump in front of this starting position and fell back to the back of the field. He aborted his run in order to save his tyres. Frans Engelen inherited P2 and kept it in style to finish in front of Florian Joos (Shepherd), the Xray of Bjorn Frederickx and the Serpent of Patrick Jongenelis. A2 was again a walk in the park for Olivier Bultynck (Shepherd) as he took the win, lap record and fastest time over 5 minutes. Steve was running strong and had P2 in the bag. Florian, who was running in P3 decided to maintain his position and preserve his tyres. Steve unfortunately crashed out on the bump which must have his name written on it, and lost valuable time. Florian tried everything to overtake him, but Steve crossed the line 0.05 seconds in front of Florian. Further down the field, the battle for P4 was raging between Frans, Bjorn and Patrick. The cars swapped positions several times, but in the end Frans had the upper hand in front of Bjorn. A3 would be the deciding final for the remaining podium spots. Steve had a great start and was followed by Frans who took a bit of a leisurely start. Florian was hot on his heels and tried to overtake him in lap 2. Both cars collided and Florian had the worst of it, sending him to the back of the field. As his car was on the racing line, he got collected by most of the other cars. This gave Steve enough breathing room to extend his lead. Frans tried everything and set the fastest lap after fastest lap to close the gap to Steve, but in the end he came one second short. Patrick Jongenelis and Kris Vanbleu (Xray) drove a fine race to P3 and P4 respectively and finished in front of Florian. The overall result was Olivier Bultynck (Shepherd), Steve Deblaere (Serpent), Frans Engelen (Xray), Florian Joos (Shepherd) and Patrick Jongenelis (Serpent). 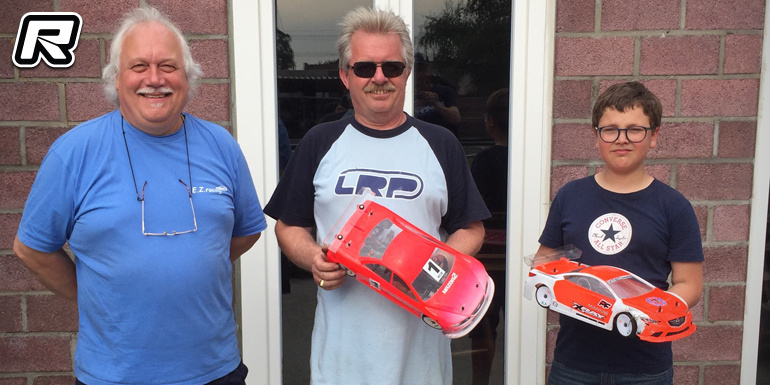 In the supporting Rookie class it was Rico Claeys (Xray) in front of Mark Joosens (Yokomo) and young Alexander Van Gansen (Yokomo).